Bridgton has a rich and varied past as a farming community, a center for trade and industry, and, with the coming of the narrow-gauge railroad and the automobile, a destination for thousands of summer visitors. The former fire station on Gibbs Avenue in downtown Bridgton houses the Bridgton Historical Society's Museum collections, archives, and research facilities. Special exhibits change every other year. and programs on Bridgton history and related topics are held throughout the year. For a map/satellite view of the area around the Gibbs Avenue Museum, please visit this Google Earth link. 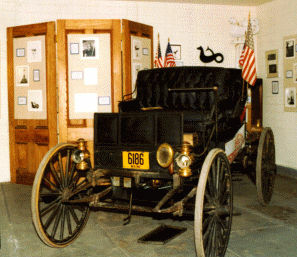 This 1909 Sears "Horseless Carriage" is just one of the many treasures you will find at the Bridgton Historical Society Museum on Gibbs Avenue , downtown Bridgton, Maine. The Carriage won 1st prize in the "The Horribles" Class at Bridgton's 1933 Old Home Days Parade. Ongoing exhibits and collections include items photos and information about the Bridgton and Saco Narrow Gauge Railroad which served the town from 1883 until 1941, a 1909 Sears Automobile, Bridgton's participation in military service, and an unusual ca. 1870 hand-painted sleigh, and much more.